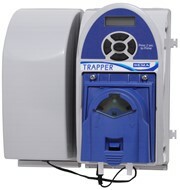 The DEMA Trapper is next generation drain and odor control dispensing designed for today’s needs. Backed by the versatile DEMA blue pump electronics platform, Trapper can dose and spray for every drain, deodorizer or special dosing application you need. A modern look, the Trapper is housed in a splash proof enclosure with a tongue and groove design that keeps electronics dry throughout use. Trapper is available in AC or DC, connect the separate battery pack or wall transformer using an external electrical jack it’s as easy as 1-2-3, go! No need spending any time on the floor, the unit comes with a mounting bracket that means you can simply slide on or off the pump and/or battery compartment for fast servicing. Trapper can out pump the competition. Using our quick change pumps, Trapper will dose up to 14oz/min (420ml/min) making sure drains, trash chutes and compactors are clear and clean. Combine the pump capabilities and long term reliability with tool-less quick change squeeze tube access, drain and odor control dispensing doesn’t get much easier.